Doubt can be a severe problem and was something that both Billy Graham and Charles Templeton faced. In the late 1940’s, Billy and Charles attended a conference in California where a number of young theologians including Charles were expressing their doubts about the authority of the Bible. They were good friends, both budding evangelists, and they discussed those doubts. 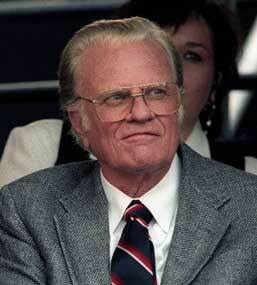 “Suddenly, I wondered if the Bible could be trusted completely,” Billy said in his book “Billy Graham: God’s Ambassador. Those same doubts eventually caused Charles Templeton to say goodbye to God. It was the 20th century, anti-creationist, scientific community claiming the earth was millions of years old (and later billions of years) that influenced Charles Templeton, who later wrote the book Farewell to God: My Reasons for Rejecting the Christian Faith. Sadly, Templeton was not able to distinguish the difference between the observations of scientists and their opinions (scientists with ulterior motives). Billy recalls the moment that changed him forever. “That night , I walked out in the moonlight, my heart heavy and burdened. I dropped to my knees and opened my Bible on a tree stump. If the issue was not settled soon, I knew I could not go on. ‘Oh God, I prayed, ‘there are many things in this book I do not understand. But God, I am going to accept this book as Your Word by faith. I’m going to allow my faith to go beyond my intellect and believe that this is Your inspired Word.’ From that moment on I have never doubted God’s Word. When I quote the Bible, I believe I am quoting the very Word of God and there’s power in it. This all occurred one month before his very successful Los Angeles crusade which marked a decisive turning point in his ministry. The Los Angeles rally pushed him onto the national scene. A lifetime of ministry has followed and even in his 90’s Billy is still impacting the world for God. The Bible is God’s Word from Genesis to Revelation and the Apostle John’s last words in the book of Revelation are warning enough to those that reject the authority of scripture.